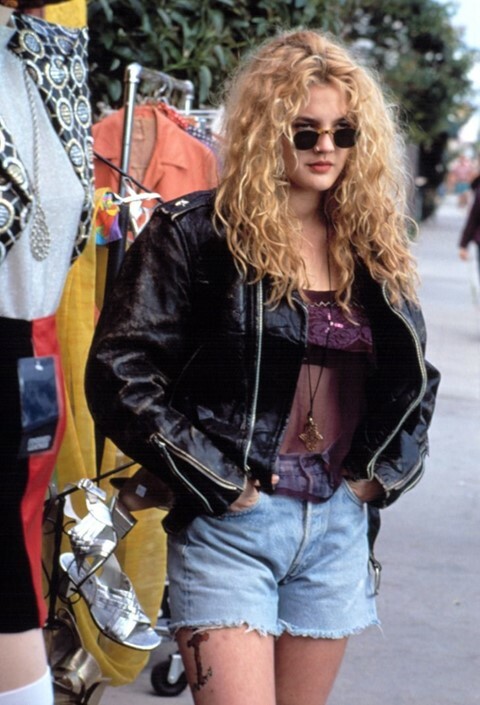 In 1992, aged just 17, Drew Barrymore starred in Poison Ivy, a film directed by Katt Shea that would become a cult favourite for the early 90s. Barrymore commands attention throughout as the eponymous lead, a cunning teen seductress who manipulates her way through the family of her high school colleague Sylvie Cooper. It might not be the most critically acclaimed of Barrymore’s films, but Poison Ivy could be one of her most stylish: she is clad constantly in varying shades of red and pale pinks as she transforms herself into the image of Georgie, Sylvie’s sickly mother. Ivy’s manipulation unfolds slowly and sees her – spoiler alert – seduce Sylvie’s father, Darrel, kill her mother in a fall made to look like suicide, and convince others that Sylvie is mentally unstable – all of which is set to a melodramatic yet eerie soundtrack. It seems only fitting, given the timely occasion, to revisit Ivy and her chilling criminal style. The film opens with Ivy swinging from a tree, her bleached locks flowing behind her leather jacket and tie-dye skirt, every inch the troubled, pensive, opaque teen anti-heroine – the very observations voiced by Sylvie as she watches her in reluctant awe. Ivy is a girl of few words, leaving her clothing to speak for her on many occasions thereby allowing the judgements of other characters (and indeed the audience) to become the focus. Ivy, we soon learn, is not even her name: Sylvie is put on the spot by her father, Darrel, to name her so-called best friend, and calls her Ivy after seeing a tattoo featuring the plant on her thigh. Red is her signature shade for much of the film: if she’s not wearing a billowing crimson trench (commandeered from Georgie, of course), scarlet leather skirt or sequinned gown, she’s likely sporting a red lip. The hue becomes part of Ivy’s chameleonic transformation into Georgie, with whom we associate the colour because of her car, her wardrobe and her bed linen; thus, Ivy’s status as master manipulator is cemented. Likewise, as Ivy copies Georgie’s appearance, her hair becomes symbolic of her shady disguise, going from ragged and nonchalantly unkempt to sleek and styled. Ivy’s wardrobe of mini-skirts, shoulder-padded blouses and the aforementioned red coat afford her a great deal of power as she uses her appearance to seduce and control the Cooper family. Her deceit is low-key in part because she often plays on her own naïveté to escape blame, creating a contrast between her feigned innocence and her decidedly grown-up apparel. To recreate Ivy’s lo-fi evil look in 2017: consider Ralph Lauren A/W17’s scarlet vinyl trench, Jacquemus’ voluminous shoulder-padded silhouettes and suiting from the likes of Céline and Balenciaga. Adopt a siren-like stare, ensure that hair is swept to one side and remember that while red lips are imperative, murder and manipulation are not.